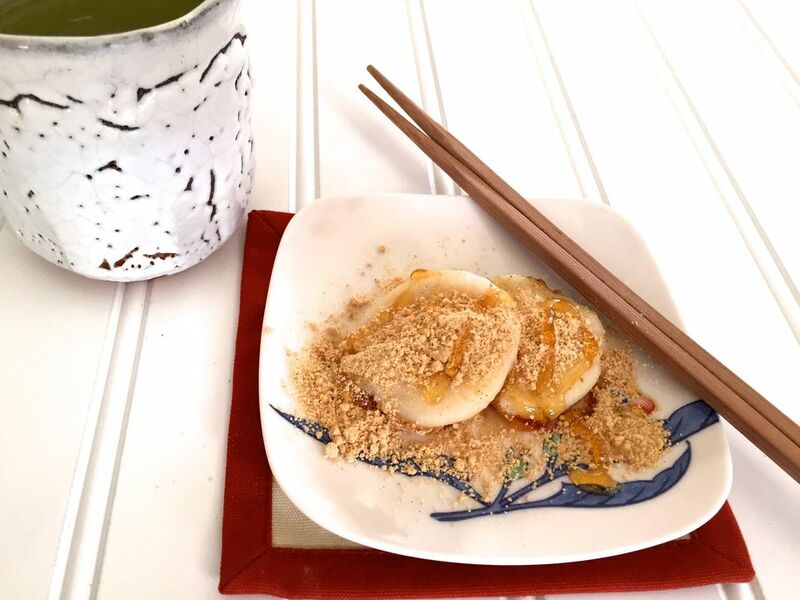 Mochi, or rice cake, is not only a staple food item in Japanese cuisine, but it is also quite popular in America and other cultures as well. Mochi is often enjoyed as a dessert but is also used as an ingredient in Japanese meals and soups. Traditionally, mochi is high in carbohydrates as it is made from rice, glutinous rice or glutinous rice flour. However, with this tofu mochi recipe, the addition of tofu (soybean curd) adds protein to an otherwise high carbohydrate food. Note, the addition of tofu slightly changes the texture of the mochi, making it more dense and chewy, compared to mochi strictly made with rice or glutinous rice. While the glutinous rice flour used in this recipe is lightly sweetened, no additional sugar is added to the dough. Instead, the mochi is sweetened by garnishing it with sweet kinako, or roasted soybean flour mixed with sugar. The dessert is delicious simply garnished with kinako, however, try drizzling a bit of honey on top for an extra sweet treat. When mixing the dough, use your hands. The tofu and glutinous rice flour mixture is slightly lumpy and dry. Small pancake-shaped mochi quick faster and more evenly than mochi shaped into round balls. The mochi is best enjoyed while warm and freshly cooked. It will begin to harden as it cools. Cut the recipe below in half if you will not be serving a large party. Remove tofu from the package, and discard water. In a large bowl, combine Mochiko and tofu. Using your hands, gently knead the ingredients together to create a soft dough. A mixing spoon or fork might also work, but using your hands is much faster and will prevent over kneading the dough. Add 1 to 2 tablespoons water, as needed, to help incorporate the mixture if needed. Note, the dough will appear slightly lumpy and crumbly; it does not need to be smooth. Using your hands, make small teaspoon size balls and slightly flatten them to create mochi that look like mini pancakes. Note, the mochi cooks more evenly if flattened versus a round shape. Cook about 6 mochi at a time, without crowding the pot. Boil the mochi for about 3 minutes until the mochi floats to the top of the water. Continue to cook the mochi for an additional 4 to 6 minutes until cooked through. The texture of the cooked mochi will be chewy and dense. Repeat. In a small bowl, combine kinako (roasted soybean flour) with sugar. Adjust the sugar to your desired sweetness. While warm, immediately serve the tofu mochi. Generously drizzle mochi with sweetened kinako powder. Optionally, drizzle honey on top. Best if enjoyed immediately as the mochi will begin to harden as it cools. Reheat in microwave to soften as necessary.